EAST, WEST, NORTH, SOUTH, MIDLANDS, BRITAIN Route ideas and places to go, many to "new" places. East-West's new west Wicklow map. Review of this mostly excellent map. Revised Settings page Members: do have a look at this. Moderate C+/B walk with A/Challenge opportunities. To take in high tops and a lake-cliff circuit. 11th of this popular twice-yearly social walk, attended by mountainviews.ie members, friends and others. Informal apres-walk meal and pub. BleckCra on Scavenger Walk 11 Book Now! For a full list of Challenge Walks, visit here. 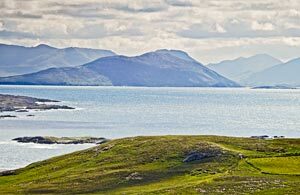 View from Inishark towards Tully Mountain in the Twelve Bens area. The stepped ridge in the distance on the right descends (r to l) from Letterbreckaun 40.01 km away in the Maamturks. Click for source comment. The Bluestacks offer many a fine hill, and none more so than Aghla with its characterful summit of rocks, loughs and ridges and views across Donegal, recounts Aidy. So says member fatredline of Slieve Meelmore in the Mournes, which offers especially great views of the Ben Crom reservoir. Multiple comments for Inishark off Mayo, which was part of Islands of Adventure 4. 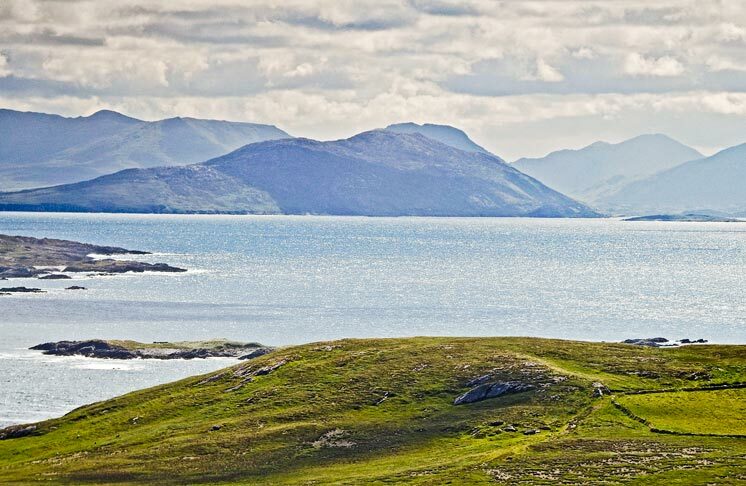 This beautiful, rugged isle was abandoned in 1960, but is still home to incomparable beauty. Exploring Abbey Hill in the fascinating landscape of the Burren, wicklore gets to know his grikes from his clints! Kinknock Hill is but a pimple compared to its more famous near neighbour, Croagh Patrick, but it is among the best places to view the reek, recount sandman and wicklore. Helpful locals farmers and a gently rising path helped ease the ascent to Nephin, a very fine summit – just don’t walk off the edge! group on Nephin: Great views, easy long climb. SOUTH: Finest views in Kerry? Conor74 makes this brave claim for Eagle’s Nest in the Purple Mountain area! Conor74 on Eagles Nest: Finest views in Kerry? wicklore's extensive programme of clumping round the South Midlands continues to spawn tracks for our delectation this month. Amongst them is his attempt to get us all to descend upon Ballynalacken Hill, where his exploration has found...something. He's not telling. Intrigued? Well, if not, there are plenty of other little tops nearby to make more of a day of it. Having taken a few too many of those old Bear Grylls pills wicklore has managed to turn an ascent of lowly Carrigadoon into an rollicking escapade replete with thorny jungle crawling and quarry edge balancing...no surprise for those of us who have experienced his swagger at close quarters. A hill that doesn't link readily to anything else, but other low summits (and Slievenamon) are close by. Scarcely unknown in outdoor circles are the facts that a) Carrauntoohil is Ireland's highest mountain, and b) the Devil's Ladder and the Heavenly Gates are two possible routes to its summit. But somehow 'up one and down the other' is a route as yet unrecorded on Mountain Views. Into the breach (and wearing shorts, probably) steps jackill, and if 'up the devil bit, down the heaven bit' seems theologically wonky, well, it's probably better to be looking up on the Ladder than looking down...gravity doesn't propel dislodged rocks upwards, after all. The descent also requires care in both location and execution. Luggala is a popular spot in Wicklow, especially because of the spectacular views over the lake which borders the Guinness estate, recounts Wicklore. EAST: A hard won but memorable summit. Dense forestry and multiple possible summits combined to make Carrick Mountain in Wicklow a tough ask, but as wicklore reports, the effort was well worth it. A blatant piece of advertising now for the upcoming Comeragh-based Scavvy extravaganza. This will be the eleventh of these shenanigans, and I'm sure all other veterans will vouch for the excellence of both the exercise and the craic. jackill has uploaded the proposed 'C' itinerary taking in Carrignagower from the Nire Valley to the west; the possibilities for extending this to further tops (such as the crowning Fauscoum) should be obvious from the map. jackill on Up the Devils Ladder and down The Heavenly gates. So advises wicklore, who along with katekat, this month discovered the delights of an apparently unremarkable Ballynalacken Hill in Kilkenny. Ballynalacken Hill will be all too readily written off as a brief stop on the way elsewhere. Despite its excellent views west it may appear to have little else to recommend it. An old ruin and a large metal tank as well as some piping in the ground adorn the summit field. The summit itself is merely a minute or two from the road. A peak-baggers dream one would think. Clashabeema in Waterford is a diminutive little bump, but affords great views of the Comeraghs, report eamonoc and jackill. BRITAIN: I wandered lonely as a...what was it again? 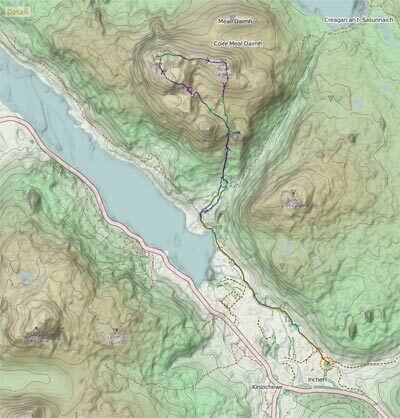 A veritable army of Irish hillwalkers invaded the English Lake District in late June, and the results of their (often impressively creative) endeavours are now uploaded to the site by user tonelagee (presumably a person rather than the entire Wicklow mountain). They completed a fair few far-from-obvious itineraries, but they also did what the late Alfred Wainwright considered to be the finest mountain walk in the district; ascending Scafell Pike (England's highest summit) via Esk Hause and descending via Sty Head Pass. This is indeed a route that showcases a lot of the district's unique appeal, from its ravishing sylvan valleys to the grey austerity of the Pike itself. Sorry if we didn't mention what you posted .. there's a list of all contributors for the month later. East-West revised "Wicklow Mountains West"
East-West mapping have brought out a revised version of their Wicklow Mountains West map, which has a 1:30,000 scale. a. Accurate forest roads, rides and paths. In our opinion the map is worth buying for this information. b. Formal and less formal parking is shown and starting points (boots symbol). c. Land coverage is somewhat shown, for example the stony ground SE of Tonelagee is shown - however this is not consistent, for example the boulder strewn ground around the Coffin Stone on Djouce is not shown. d. Some people do not like intermediate scales like 1:30,000 or 1:40,000 however I think this often represents a reasonable compromise between coverage and detail. a. East-West are continuing to promote an all numeric approach to grid references and deemphasising the usual Letter+digits approach. For example they say that Tonelagee can be represented as 308 201 (to 1 km accuracy). MountainViews and ALL other popular resources using the Irish Grid would refer to this as O08 01 (to 1km accuracy) or the usual 6 digit grid ref of O085 015 to 100m (MV goes further and shows a 1m accuracy value of O08503 01589). The map does emphasise the correct grid square letters to the side, however they are NOT REPEATED on the map. Picture the scene while you are walking. You have a GPS which will tell you your grid reference. You want to see it on the map but your map is folded into a mapcase. In order to figure out where you are on the map you would have to unfold the map and of course the usual times you want to do this is when it is raining, windy and your party does not want to hang around. So East-West please repeat the grid square letters so that they can be read on a folded map. b. East-West includes a lot of names that do not appear on other maps. They say "The names appearing on these maps should not be regarded as fully definitive – hopefully they are a better representation than that which has appeared heretofore but there is always scope for improvement." and also "In some cases the location & attribution of names to certain features is educated guesswork". They believe it is important to retain names and this is better than getting some wrong. One thing I would refer to in East-West mapping is the need for clarity by hillwalkers. On a previous version of this map Silsean and Moanbane were reversed. This is confusing and in rescue situations downright dangerous however the map now has changed so that Moanbane is back where it is on the OS if the spelling is different. Another example is the issue of Mullaghcleevaun East. According to East-West this should be called Stony Top because the local farmers call it this. And further calling it Mullaghcleevaun East "..has all the hallmarks of a ‘bureaucrat’ who didn’t know the name and just added East to the name of the main summit." In my view this sort of dialogue is not helpful. The main people visiting the area are recreational users such as hillwalkers not farmers and it is entirely reasonable for them to create names for important summits where none are clear. When doing so the names need to be non-confusing. There already is an established "Stony Top" about 4k to the south beside Tonelagee. It is dangerous and confusing to call Mullaghcleevaun East by the same name as somewhere else nearby. See map section to the left for the double helping of Stony Top. As for the pejorative bureaucrat label: the well established name of Mullaghcleevaun East Top is what Joss Lynam and others called this summit as early as 1952. Lynam and the others were people who wanted to give a distinctive name to the place in the absence of any other authoritative source. Bureaucrats? Get real. As far as I am concerned placenames in Ireland are a considerable mess and there is no totally correct answer from a cultural or historical point of view. To rectify this I think that there should an active, unpoliticised authoritative body to which we could all refer. In the absence of this, I am reluctant to include or change names for which there isn’t an academic or official consensus. However one aspect that is clear is that the hillwalkers of Ireland need maps with unambiguous names. We recommend this map because of the hugely useful and recently updated detail it has. The Ordnance Survey will not find it easy to source this level of detail in their planned and ambitious 3 map (six page) 1:25,000 series for the Dublin Wicklow area. At present however there is little choice other than East-West if you want good detail. Can we end on a positive note, East-West and MountainViews now cooperate in various areas even if we may differ on some. MV is mentioned on East-West's website and on the map. MV heights - some surveyed - are used on the map and Arderins are denoted with a blue height figure. We are indebted to East-West for bringing to light the 1952 listing created by Joss Lynam and others. We support competition between suppliers which will benefit us all. In order to have a better understanding of the membership MV has added various fields to the Settings page. We are also interested in finding out what club or clubs people are in, if you are in one. Please do fill in these details. Settings are accessed at the top right of any MountainViews page when you are logged in. simon3 on New feature: Settings Page additions. Most easterly summit in Ireland described. MountainViewers have now reached and described a hill for all four points of the compass for Ireland. Most southerly Cnoicín an tSeabhaic, 160m Mizen/ Sheeps Head area. Most easterly Ballywhite Hill, 101m Belfast Hills area. Most westerly Tearaght Island, 200m Dingle West area. Description of the most easterly. The final compass point summit to be described. Eastern Reeks: www.youtube.com/watch?v=jHkosNQuHX8 rossbeighd - Longish video, with POV scrambling - weird to hear young people talking about "feet" - interesting but could use some severe pruning as 37 mins is too long. Landscape matters: www.youtube.com/watch?v=iZFtC5SuS6I hlawless - Persuasive in style - well worth a look - see if you can work out where some of the scenes were shot. Captain Vertigo reviews Gerrym's videography. MountainViews first book available online and in many bookshops. The first reprint with numerous minor amendments is now out. and these tracks Achillbeg Island S Top, Achill/Corraun Ireland, Achillbeg Island S Top, Achill/Corraun Ireland, Ballinacorbeg, Dublin/Wicklow Ireland, Ballynalacken Hill, South Midlands Ireland, Been Hill, Glenbeigh Horseshoe Ireland, Binn Ghuaire, Twelve Bens Ireland, Carrauntoohil, MacGillycuddy's Reeks Ireland, Carrigadoon Hill, South Midlands Ireland, Carrignagower, Comeragh Mountains Ireland, Carrignagower, Comeragh Mountains Ireland, Catstye Cam, Lake District - Eastern Fells Britain, Corraun Hill East Top, Achill/Corraun Ireland, Crohane, Mangerton Ireland, Faranaree Hill, South Midlands Ireland, Fossy Mountain, South Midlands Ireland, Galtybeg, Galty Mountains Ireland, Hell Gill Pike, Southern Cumbria Britain, High Snab Bank, Lake District - Central & Western Fells Britain, Inishark Island, Mayo Islands Ireland, Inishark Island, Mayo Islands Ireland, Inishark Island, Mayo Islands Ireland, Inishturk, Mayo Islands Ireland, Knockshanahullion, Knockmealdown Mountains Ireland, Lake District - Central & Western Fells Britain, Lake District - Central & Western Fells Britain, Loch Maree to Loch Broom Britain, Seefin Mountain W Top, Ballyhoura Mountains Ireland, Slieve Elva, West Clare Ireland, Souther Fell South Top, Lake District - Northern Fells Britain, St Raven's Edge, Lake District - Eastern Fells Britain, Temple Hill, Galty Mountains Ireland, Tonelagee NE Top, Dublin/Wicklow Ireland, W Limerick/N Kerry Ireland tracks and these walks were created Bangor Trail - High Level. Thanks to all 1138 who have ever contributed summits or routes info and forums. Summary. MountainViews now has 7020 comments about 1268 different hills & mountains out of the total in our current full list (1384). We want to get a good gps track showing each of the major ways up every summit in Ireland. If you see an option to add a "Short Summary" then do please consider creating one since another objective is to have a short summary for every summit in Ireland. There's a few (116) opportunities for you to be the first to comment on a summit. Report quads in national park area (in which they are banned). For Wicklow please phone the Duty Ranger: 087-9803899 or the office during office hours Telephone: +353-404-45800. Put these numbers in your phone, take regs etc. Let MV know of contact numbers for other areas. Alternatively let us know by email at admin@mountainviews.ie Include the email address you got this at or your screen-name.